A quick facial pick-me-up includes an exfoliation facial massage, and a customized masque that leaves skin feeling smooth. Finished with a moisturizer. This Facial is an excellent introduction to the Dermalogica skincare system. This facial treatment is truly revolutionary because it is customized at every step by the skin care therapist, based on your individual face mapping analysis. A purifying deep cleansing facial to effectively and gently treat acne and improve problem skin. This service can be performed in a series of treatments. Ask for details. This uniquely tailored service will leave your skin feeling smoother, brighter and hydrated. With a delightful massage, exfoliation and customized mask, your aesthetician will create a facial treatment that is perfect for your skin care needs. 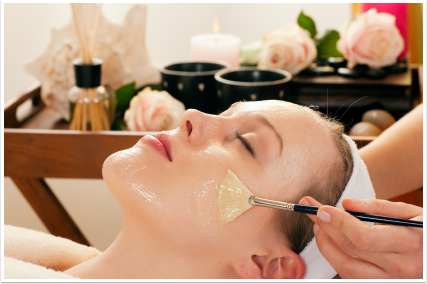 Come indulge with our Signature Facial and leave feeling relaxed, healthier and refreshed. Give your skin a revitalizing power boost with this treatment designed to help firm, nourish, smooth and energize the skin, while controlling the biochemical triggers that lead to skin ageing. The active vitamin and hydroxyl acid exfoliation, resurfaces and retextures the skin while the energizing massage releases tension. Relax and enjoy this deep cleansing facial designed especially for men. A refreshing cleanser is applied followed by a gentle exfoliation. Next, facial muscles are massaged to relax and tone the skin. A masque is then applied, followed by steam aromatic towels and a hydrating moisturizer to complete.